Mike Huckabee's alternate reality of the Arab-Israeli conflict. The Gush Katif Museum in Jerusalem was a fitting venue for U.S. presidential hopeful and Republican leader Mike Huckabee this past Wednesday. The museum is a monument to the Gaza disengagement, which most Israelis see as a failure--and which looms large in their minds as they anticipate demands from Obama for further settlement evictions. Huckabee has come to the Holy Land this week to present Israelis with a completely different vision, spending much of his trip condemning Obama's pressure to halt settlement construction. He kick-started his tour with a provocative interview with Israel’s Channel 2 News, upturning Jimmy Carter’s analogy of Israel as an "apartheid" state: "The closest thing we [in America] ever had to that"-- namely the demand that Jewish settlers leave their homes located on what most of the world believes is Palestinian land--"was the days of segregation, racially, where there were white neighborhoods and there were black neighborhoods." Huckabee is no opportunist; this isn't the first time he has made statements in line with the views of far-right Jewish settlers. The GOP leader has merely repeated this week in Israel what he has been saying publicly for years, both in Israel and on the campaign trail. Those outraged by his support this week of the controversial Jewish housing project in the Sheikh Jarrah neighborhood of East Jerusalem should not be surprised: Visiting Israel exactly one year ago, Huckabee explained, "To say that Jews can't live in Jerusalem is the equivalent of telling the Boston Red Sox they can't play in Fenway Park. Obviously, that would never go over very well on Beacon Hill." It’s a stark contrast not just to Obama’s approach--but decades of U.S. bipartisan policy towards Israel. While most observers have a hard time realizing it, there is not much of a difference between the Bush presidency and the Obama presidency when it comes to the Israeli-Arab peace process. Yes, Obama is more “engaged,” more ambitious, more determined, and acting with a greater sense of urgency. He is also more aggressive in his treatment of Israeli feet-dragging. But overall, Obama hasn’t changed much when it comes to the strategic goals set by the Clinton and the Bush administrations: two-state solution, Jewish state, Palestinian state, settlements dismantled, right of return denied. If there is a difference, it is mostly temperamental. After all, Bush too was set--at least rhetorically--on the establishment of a Palestinian state in the near future. "We agree to engage in vigorous, ongoing, and continuous negotiations, and shall make every effort to conclude an agreement before the end of 2008," reads the document produced at Bush’s Annapolis Summit. Huckabee is becoming one of the loudest voices in a small (but growing) chorus of people who aren’t just tired of trying to make peace between Israelis and Palestinians, or pessimistic when it comes to the prospects of achieving such peace any time soon. These people--among them right-wing hacks and former generals, messianic radicals and cold-calculating strategists, populist politicians and idealistic dreamers--think that the whole paradigm of peace as we know it should be eliminated from the books. The reigning world vision of an Israeli-Palestinian peace is, they believe, so ’90s, and should boldly be replaced by new paradigms. Huckabee is the best hope that settlers and their supporters can entertain of turning this relatively marginal viewpoint into a legitimate position. 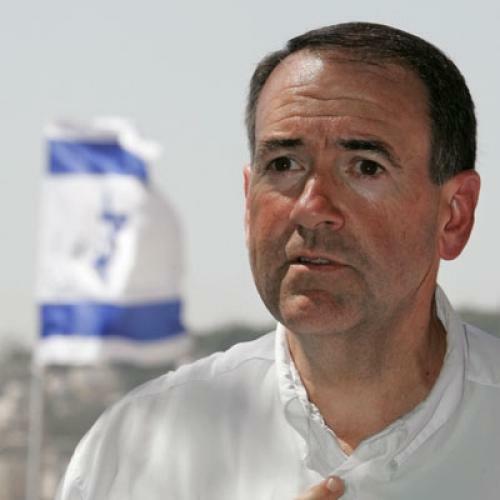 Thus, Huckabee isn’t just an alternative to Obama--who was the preacher’s primary target in Israel. He may be the first viable presidential hopeful of the last two decades to challenge the fundamental assumptions of America’s Israel policy. Is he really a viable candidate? Political observers say he is. Is the alternative he presents viable? It seems radical and out of touch. It is also half-baked: Huckabee is very precise about what should not happen (no evacuation, no limiting of settlements, no Palestinian state in the land of Israel, no division of Jerusalem), but has yet to present a more comprehensive alternative--an actual plan that can work, or at least has some chance of working. On the other hand, Obama has yet to present such a plan either.